With temperatures hitting record lows, you might be wishing you had a Caribbean island getaway planned. You may be lamenting that you missed out, but you haven’t yet. There are still plenty of seats on flights to Caribbean islands that you can snag with your miles. Depending on where you live, you may or may not be able to get a nonstop flight to the island of your choice. It’s easiest to look for flights from airline hubs directly to the island and then go back and try to find a feeder flight from your local airport to the hub city. We looked at flights from one airline in each alliance: American Airlines in oneworld, Delta in SkyTeam, and United in Star Alliance. The hub cities for these airlines are listed below. There may also be nonstop flights to your island of choice from non-hub airports as well. Since you’ll be searching for last-minute award availability, start with the most popular Caribbean islands. 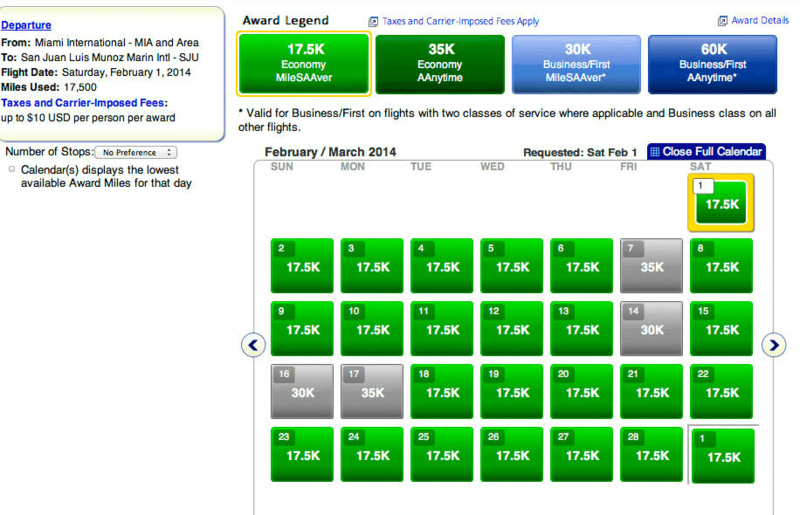 More flights will head to those islands and that will increase your shot at finding available award seats. RewardExpert took a look at a few popular routes and here’s what we found. You can still get award flights to San Juan in Puerto Rico, Montego Bay in Jamaica, and Bridgetown in Barbados. There are a ton of direct flights from the United States to San Juan and you can also connect to other Caribbean islands from here. American offers nonstop flights to SJU via DFW, JFK, MIA, and ORD. 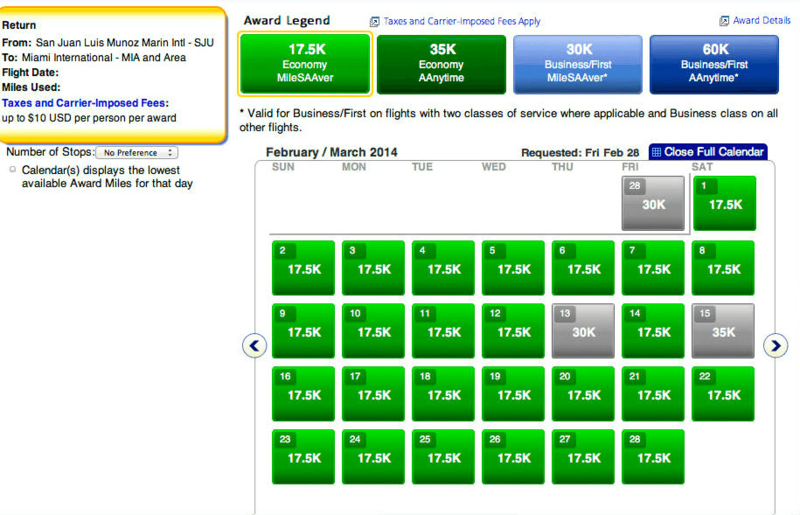 We checked availability for the month of February and found that American had tons of economy flights ready to book. Availability was best from Miami with flights available nearly every day in both economy and business. Flights were also very available from DFW and JFK with outgoing flights looking best on Sundays, Mondays, and Tuesdays. Wednesdays and Thursdays had a fair amount of available flights but pickings were slim on Fridays and Saturdays. There appeared to be good BusinessSaver availability, especially if your travel plans had you departing Sunday, Monday, or Tuesday. The best days of the week to return from Puerto Rico are Tuesdays, Wednesdays, and Thursdays for both economy and business seats. Chicago had the least amount of available award flights. Delta offers nonstop flights to MBJ from ATL, DTW, JFK, IND, and MSP. 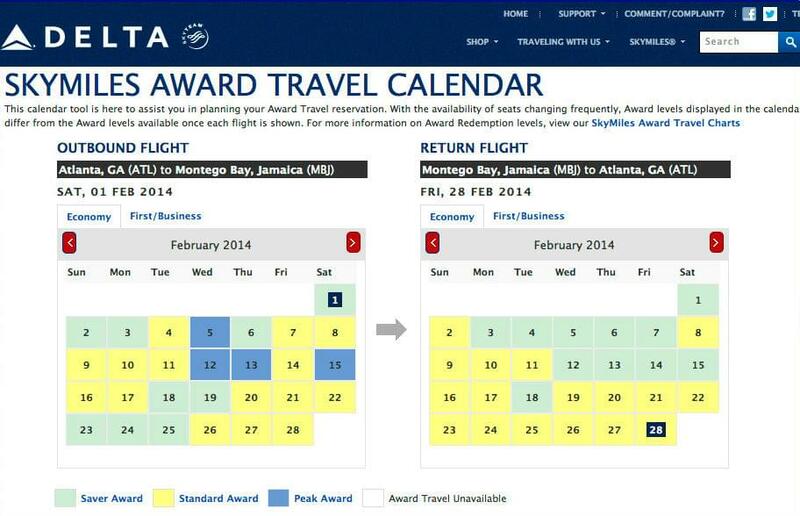 Deltas online award calendar is not incredibly reliable but in the following example, the chart is showing MBJ-bound flights from Atlanta at low mileage levels on nine days sprinkled throughout February. Standard awards are available on the other dates. Return travel availability is similar. United offers nonstop flights to SXM from EWR, IAD, and ORD. United offers award flights at saver and standard rates. 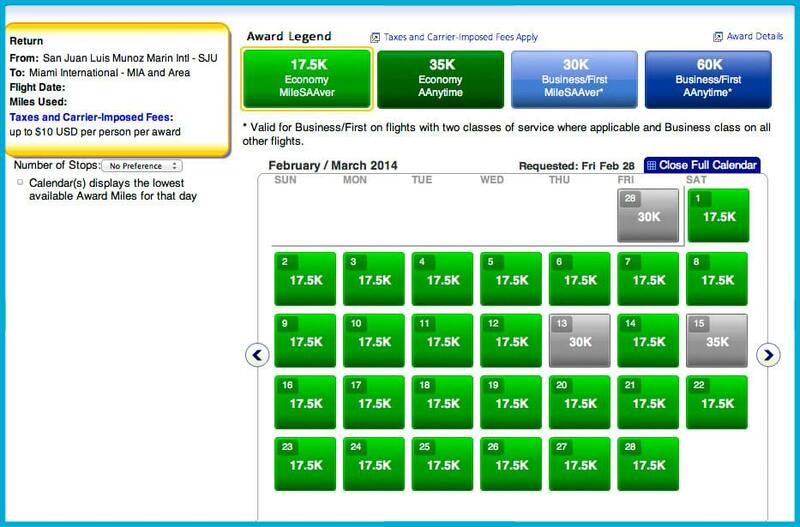 There was sporadic availability in economy and business class cabins throughout February. It won’t be as easy to get a United flight to St. Maarten as it is to snag one to San Juan on America, but it’s totally possible if your dates are flexible.